EDITOR’S NOTE: Some names have been changed for anonymity. Three professional staff members have left Pepperdine as of Jan. 27. This change in Housing and Residence Life personnel was the result of an incident in Morgan Hall that occurred over Christmas break, according to several University staff members who spoke on condition of anonymity. The four staff members include Resident Directors Michael Harri and Brittney Patag, Assistant Director for Intercultural Affairs Bryce Coefield and Associate Director of Resident Life Brandon Farmer. “Regrettably, there was an incident on campus involving several University staff members. Student Affairs and the Department of Public Safety worked cooperatively to investigate the incident thoroughly and have taken appropriate action,” according to a statement issued by Public Relations on Jan. 31. Farmer, Dean of Student Affairs Mark Davis, and Associate Dean of Students Jon Mathis declined to comment. 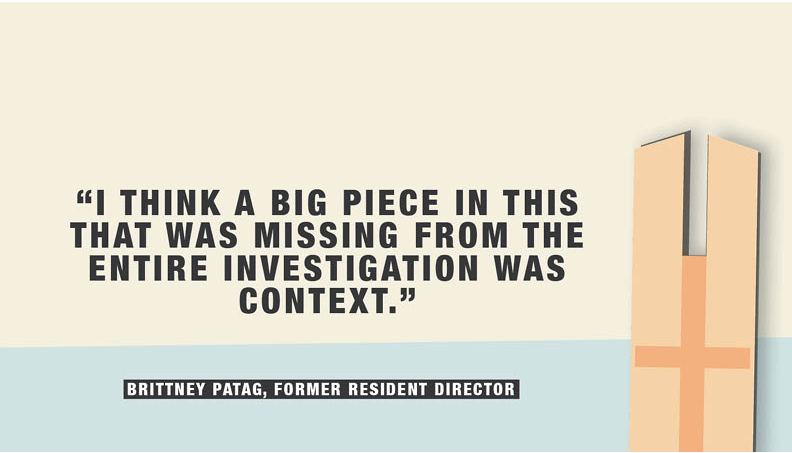 Patag filed a grievance against the University on March 3, 2017, alleging “several discrepancies with how the investigation was handled,” according to the grievance. Pepperdine has since issued Patag a check for five months of back pay and changed her resignation date to May 15, 2017, Patag wrote in an email. On Dec. 16, after an evening get-together at Harri’s on-campus apartment, six staff members and Patag’s husband, Alex Patag, went into Morgan Hall and spray-painted on its walls, according to University staff member Kate Wilson (name changed), who said the group also “discharged a fire extinguisher and ran from the ensuing fire alarm.” Patag herself attended the get-together but did not follow the group to Morgan Hall, she wrote in an email. After the alarm sounded, DPS officers arrived and began an investigation. Harri had left the scene after spray-painting a smiley face and was not present when the fire alarm went off, according to several University staff members who wished to remain anonymous. At this time, it is unclear what messages were spray-painted on the wall. The walls of the dorm were already painted by students who had received approval from Department of Facility Services and RDs as long as the paintings were “reflective of Pepperdine and existing community living standards,” Director of Facilities Services Carly Mischke wrote in an email. She also wrote that spray-paint was not allowed by students. “If the finished product was found to be in bad taste or offensive in any way it would be painted over,” Mischke wrote. Patag wrote that the rule against spraypaint was not made clear to HRL before the incident. As Morgan Hall was not roped off or closed up in any way, Patag said staff members did not break in. Patag wrote that she did not set foot in Morgan that night. She said she went home after the get-together because she did not feel well. As the RD on duty, however, Patag was responsible for responding to the DPS emergency call. According to Patag, the individual who tampered with and discharged the fire extinguisher was not asked to resign. Though Coefield, Harri and Patag were asked to resign nearly two months ago on Jan. 27, they are still listed as staff members on the University’s website. When asked why Coefield, Harri, Patag and Farmer were the four asked to resign out of the eight employees involved, Patag answered that she could only speculate. Between the incident on Dec. 16 and being asked to resign on Jan. 27, the involved staff members waited six weeks to hear the University’s decision. During this time, Patag did not speak with a representative in Human Resources and was not told what charges were mounted against her, according to her grievance. Coefield expressed his sentiments about leaving his position. Assistant Director of the Pepperdine Volunteer Center Justin Schneider, who said he is close friends with Coefield, offered his perspective on the incident. Schneider said any time a person is let go, many factors need to be weighed, such as the cost of hiring and training new employees. The six remaining Resident Directors will continue to fill in the gaps left by Harri and Patag for the remainder of the semester. A student in Patag’s staff group said many students are feeling “left in the dust” as a result of the staff resignations. Update made on Nov. 30 at 3:20 PM: Brittney Patag filed a grievance with the university after her resignation and was granted back pay and a change of resignation date. The individual who discharged the fire extinguisher was not asked to resign. Patag claims that the rule against using spraypaint was not made clear to HRL before the incident. Update made on Mar. 18 at 10:47 AM: Brandon Farmer will be leaving Pepperdine at the end of spring semester on his own volition. Update made on Mar. 16 at 9:29 PM: At this time, it is unclear what messages were spray-painted in Morgan Hall.